Tag based memory structures are what most new generation PLC/PAC's use. A tag is a friendly name for a memory location. This tag name also has a data type assigned. In this section we will use the Allen Bradley ControlLogix PAC. Refer to the manufacturer manual for other PAC brands. Could be a tag name for the start push button of a process. A tag that could be for the mixer motor on process vessel 01. A tag name that could be use to store the temperature value read in a furnace. There are several rules that must be followed when creating tag names. Tag names can contain numbers, letters (not case sensitive) and single underscore. The maximum length is restricted to 40 characters. Tag names must begin with a letter or an underscore but can not end with an underscore. Mixed case is used for ease of reading such as: Conveyor_2 or Conveyor2 and not CONVEYOR_2 or CONVEYOR2. would keep all the tags associated with Conveyor2 grouped together. When a tag is created it must be assigned a data type. The basic data types are 'basic' and 'structured'. The following tables outline the basic data types and the most commonly used structures. 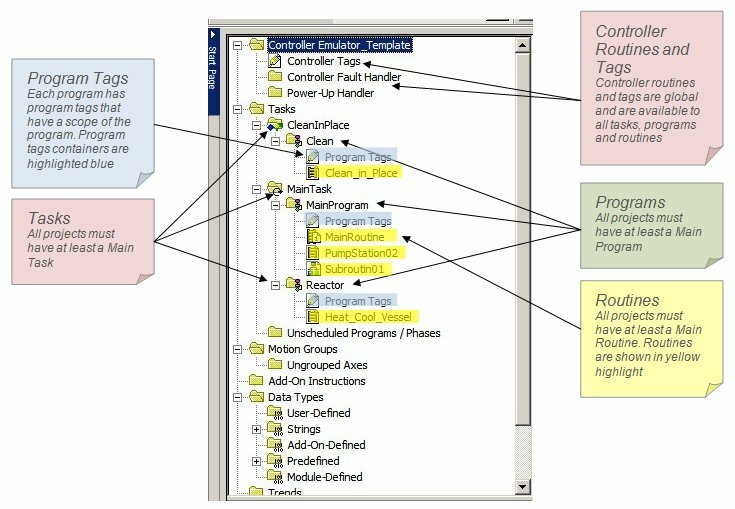 Before continuing with tags, data types and structures, it is important to understand the structure of a ControlLogix project. ControlLogix projects consist of Tasks, Programs and routines. The following is a graphical representation of a ControlLogix project. Refer to this graphic during the following descriptions. A ControlLogix project (the large light blue box in the ControlLogix project structure graphic above) contains all of the elements that make up a program. Everything required for the program to function is contained within the project. It holds information necessary to schedule the programs execution. It sets and determines the execution priority for one or more programs. As stated above there are two types of tasks, continuous and periodic. A continuous task is represented by the white task box in the ControlLogix project structure graphic above. Continuous tasks execute non-stop. Every project must have, and can have only one continuous task. The other tasks in the above grapic would be periodic tasks. A project does not require periodic tasks. A project only requires a continous task. Periodic tasks interrupt the continous task and execute for a prescribed length of time and at specific time intervals. When the time expires, the task executes one last time. Periodic rates can be from 1ms to 2000 seconds. The default period is 10mS. Each task requires at least one program. A task can have up to 32-programs. Only one program can execute at-a-time. When a program executes the main routine executes first. The main routine is used to call (execute) other routines in the program (subroutines). For those who are familiar with the AB SLC500 or PLC5, the main routine is the same as LAD 2. Any and all additional routines within a program are called subroutines. Subroutines are used to keep programs organized. They contain executable code, just like the main routine and can be written in any of the 4-languages listed above. Subroutines will only execute when they are called from the main routine or from another subroutine. An example for the use of subroutines could be: An assembly area uses a rotary indexer that has 10-different assembly stations. There can be 10-subroutines with each subroutine containing the program code that controls one of the assembly stations. These subroutines are called from the main routine or from other subroutines. If the product being produced does not require the 10-assembly stations, the subroutine call to the assembly station(s) not required can be disabled and that/those stations will not be included in the process. 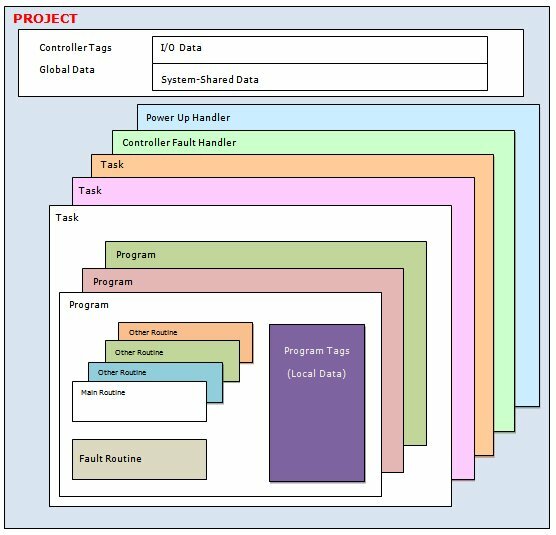 The program tags are represented in the purple box in the ControlLogix project structure graphic above. Tags that are used within a program are stored in that program and have a scope of that program. Scope will be discused later. Controller tags are represented in the white box in the ControlLogix project structure graphic above. Controller tags are global tags. Globa tags are tags that store values available to the entire project. I/O data and system-level and system-shared data are examples of global tags. The scope of a tag is where and when the data stored at the location in memory referenced by the tag is available. Some languages call scope, lifetime. The data in a program scoped tag is only available when that program is executing. The tag and its data are not available to any other program. When the program stops executing and transfers control to another program the tags in the stopped program are no longer available. Program level tags assist in keeping data organized and also assists in security by providing data hiding. The following figure is a screen shot of the Rockwell Automation RSLogix 5000 project window that shows the tree structure of an RSLogix 5000 project. All instructions are assigned a base tag. The base tag is a tag name that represents the process function and is assigned a data type appropriate for that function. As an example: A mixing vessel on the north side of the plant might have a base tag name; North_Vessel_Mixer and if this tag is being used to turn on/off the mixer motor it would assigned the data type Bool (0 or 1). An Alias For tag is another name for a base tag. I/O points are assigned to base tags using an Alias For to the I/O module point. The location specifies the network location for the data. Local is used if the I/O module is in the same rack as the processor module. An adapter name is used to identify a remote communication adapter such as a DeviceNET remote I/O block. The slot is the slot number the I/O module is plugged into. Slots are numbered with slot 0 being the first slot on the left side of the rack and continues counting up by 1 going to the right. A submember is specific data related to a member. More on this later. The bit number specifies a bit number for an internal instructions or a screw terminal for I/O modules. Only two delimiters are used; Colons (:) and periods (dots)(.). If an address is a control-type tag, a (C) is placed at the end of the address to indicate that the tag is a controller scoped tag. There is no submember for the Alias For.